Frogskin (FSD) is an important cassava disease that affects roots. The causal agent remains unknown, even though it has been reported with increasing frequency in Colombia, Brazil, and Venezuela. Yield losses close to 90% have been reported in commercial fields in Colombia. The specific primers R16mF2/R16mR1 and R16F2n/R16R2 were used in a nested PCR assay to detect and confirm that phytoplasms were associated with FSD. To characterize and subsequently classify the phytoplasms, two pairs of universal primers (P1/P7 and R16F2n/R2) were used to amplify the 16S rDNA gene. Root, stem, leaf, and flower samples were taken from symptomatic plants, and 1.2-kb fragments amplified. Sequence analysis of the cloned fragments revealed that the phytoplasms found were similar to the Chinaberry yellows phytoplasm (GenBank acc. no. AF495657, 16SrXIII Mexican periwinkle virescence group) and the Cirsium white leaf phytoplasm (GenBank acc. no. AF373106, 16SrIII X-disease group), both with a sequence homology of 100% and 99%, respectively. 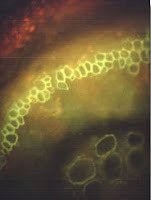 The presence of phytoplasms was confirmed by the DAPI and Dienes’ staining methods and by grafting. This is the first report of phytoplasms associated with FSD in cassava.